West Windsor, N.J. – Their aspirations range from figuring out their majors and simply being happy to becoming politicians, doctors, educators, research scientists, and CEOs of major companies. Oh, and making a difference in the world is also on their short list. MCCC freshmen who are enrolled in American Honors at Mercer (AH@Mercer) attended the program’s “Dream Big” dinner on Oct. 27. Keynote speaker for the evening was Phil Bronner, the CEO of American Honors/Quad Learning based in Washington, D.C. According to AH@Mercer Advisor Nick Geremia, the evening was designed to recognize and inspire the program’s 81 first-year students as they build a community of scholars with their peers. Some parents attended, as well as MCCC faculty and staff. In his remarks, Bronner encouraged students to make the most of their opportunities today as they reach toward their dreams for the future. Also addressing the students was MCCC President Jianping Wang. Dr. Wang spoke about her own challenges as a woman trying to gain an education in a Chinese society. In a new initiative at Mercer, second-year AH@Mercer students volunteered as program ambassadors, helping with set-up, breakdown, and organization of the event. 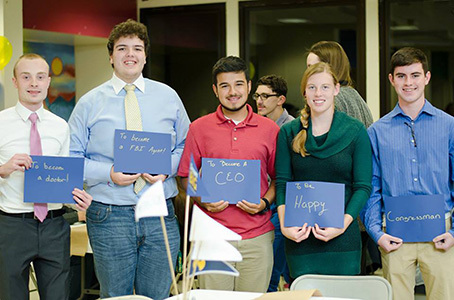 From left, first-year American Honors students Nathan Schmalbach, Garrick Falcetano, Pablo Araya, Gwyneth Curbishley and Daniel Hurley. 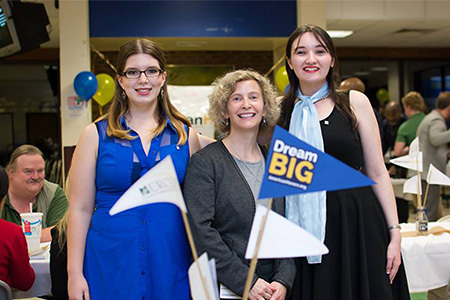 AH student ambassadors Brittany Mudri, left, and Katie Gyenge with Dr. Gianna Durso-Finley, Assistant Dean for American Honors (center). 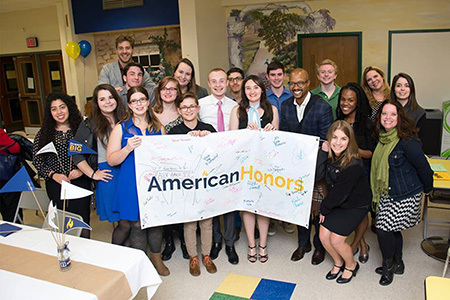 American Honors students are making their big dreams happen at Mercer.